Denver is made from a multicoloured tie-dyed material with black button eyes and a larger black button nose. He wears a multicoloured ribbon tied around his neck. On his chest are the words “I love Denver” embroidered in red thread with the word “love” represented as a heart shape. Making Denver a great city! Denver was released on 28th August 2004. His birthday is on 7th November 2003. 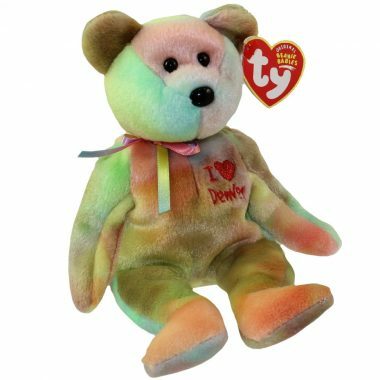 He is a Ty trade show exclusive bear. He retired on 14th October 2004.